A layout that suits your needs. With the wrong layout, your home or work space can feel like it needs a fortune to make it work for you. By analysing your existing space and bringing in the right storage, you can transform your space and your way of living or working. A more cost-efficient alternative to a full redesign, our Organise Service maximises your space efficiency to ensure you're making the most of what you already have, saving you time and money. Through our consultation process, we bring you the best layout and bespoke storage. Sometimes you don't need a whole new design; all you need is to get organised. In addition to what Forster Inc can provide, we have two other solutions to take your organised living/working even further. Forster Inc’s sister brand, SortedLondon, transforms your office or home into an organised and clutter-free space, first through a consultation and then by reducing and curating your things. Rachel & Becky are a mission to share the life-changing effect of having a sorted space, one cluttered room at a time. Looking to streamline your flexible office working? Designed in collaboration with Forster Inc, HotBox’s HB-two model is the flexible portable storage system for all the things you need at work. Choose the interior storage to suit your needs and finish off with a fabric cover of your choice. Carry your laptop, tablet, files and pens in style, and individualise your space. 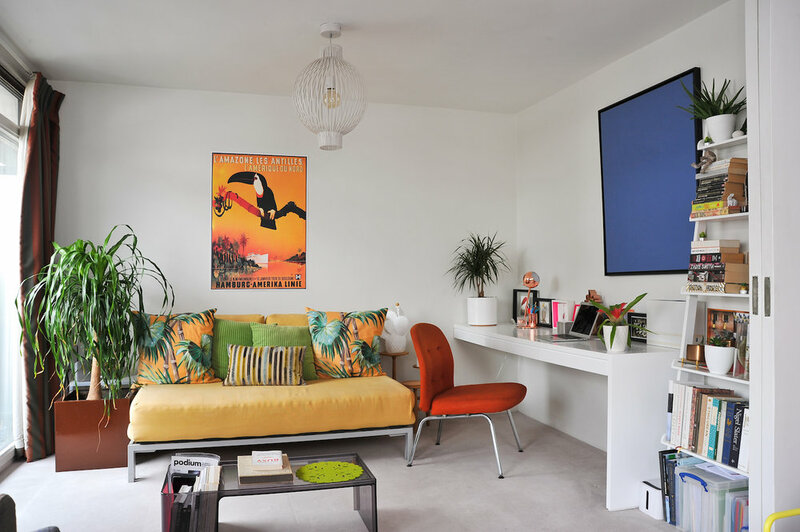 The client of this Barbican flat requested Forster Inc to design and build fitted organisational features that would tie into the modernist character of the flat. For the desk, rather than have a freestanding unit, we created a built-in desk in white that fits seamlessly into the interior of the building. 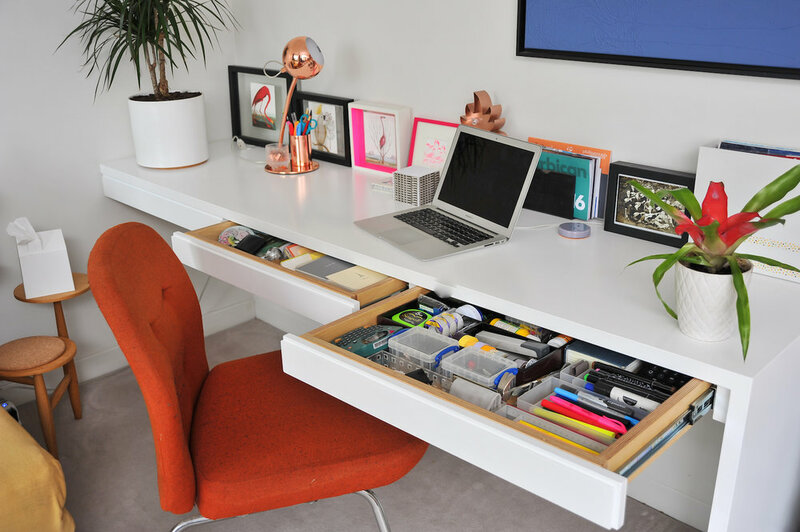 Inside the desk, we incorporated three slimline drawers with individual compartments to hold all of her stationary and desk items. The entire piece was built and installed by our furniture makers. Having seen the work we had completed for previous clients in the Barbican, this client asked us to create a similar bespoke under-counter unit that could fit all of her bathroom essentials but that also was in character with the original building features. Fitting the storage in was tricky, with a network of piping underneath the basin, but we managed to create a streamlined storage option designed to fit products perfectly. With 47 pairs of shoes to store, this client needed a slim, functional yet beautiful shoe storage piece that she could place in a corridor. We again kept with the original character and style of the building with similar materials and keeping the unit white. 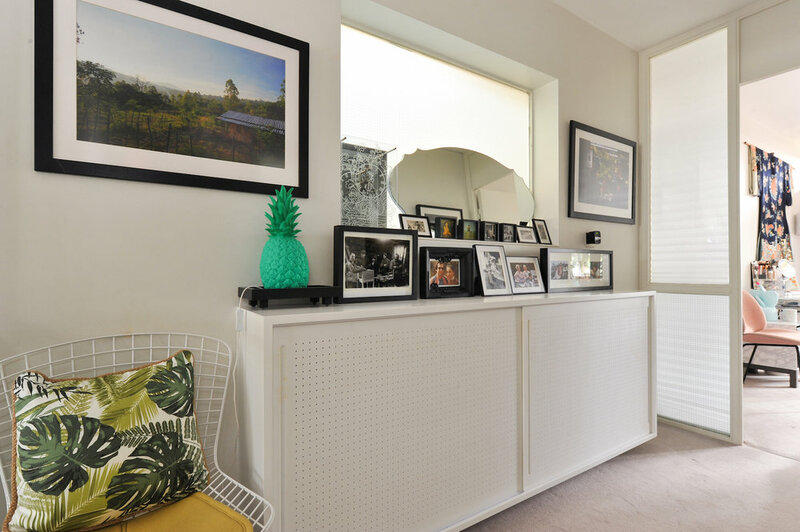 This focal feature not only is a well used shoe storage but also serves as a mantel to display pictures and decorations. This bespoke shoe storage unit has four shelving compartments to fit a variety of shoe heights. The shelves are made of Corian, to ensure the unit is as slim as possible. The sliding doors, also made of Corian have holes cut in them to replicate pegboard. A multi-function working space, this cluttered photographer's studio was in need of a storage system that was streamlined and easy to use. We rearranged the layout to make the space more efficient, and we created bespoke storage units in natural materials, such as plywood. The result is a functional and organised system that is easy to access and easy to maintain. Our client asked Forster Inc to transform this small and cluttered family bathroom into an organised bathroom and utility space. We designed built-in cabinets with flush doors and magnetic catches to help create a seamless and functional storage facility. By opening up the space, we were able to relocate the washing machine into the bathroom and create a utility area. This small Barbican flat needed a design that housed 10,000 CDs. In order to do this, we reconfigured the interior of a under-used storage cupboard to have pull-out drawers with soft closers. A sliding door helps to close off the CD storage and creates a seamless effect with the wall. Once we converted this outdoor space to an interior extension, we needed to incorporate additional storage for this family’s book collection. We built a bespoke bookshelf that wraps around the room and blends in with the walls. The result is a shelving system with minimal impact to the room, keeping the floor clear and giving the illusion of a bigger space. 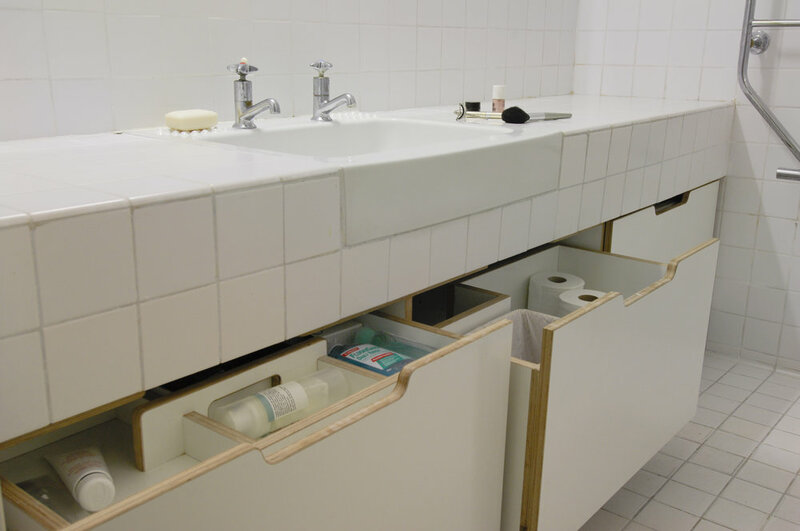 Prior to our design, the only storage in this bathroom was a pile of plastic boxes that looked messy and disorganised. This family wanted a streamlined solution for storing their bathroom essentials while keeping with the character of the Barbican flat. We built bespoke pull-out drawers that fit neatly under the basin, complete with a detachable makeup caddy. The result is an organised and efficient use of the space that the family loved. 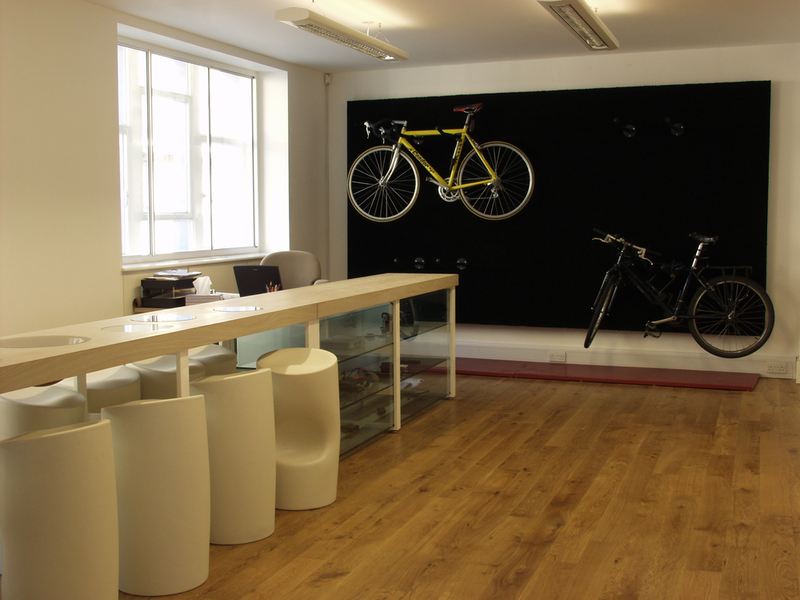 Many members of staff cycle at this digital agency, leading to a daily pile of bikes that looked messy in their small reception. Our wall-mounted bike rack solution accommodates 8 bikes neatly and efficiently. We added a drip tray underneath to collect rainwater and dirt, which helps to keep the space clean for clients. Helping clients achieve the most organised, clutter-free life is why we went into design. We believe passionately in sustainability and using what you already have first and foremost, before buying more.